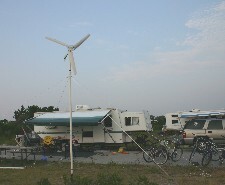 Ever seen a wind-powered camper? Below is my version of a short piece on wind-turbine maker Michael Powers that appears, with Wessel’s photo, in this month’s Ode Magazine. After it ran, someone from “Weekend America” on NPR contacted me for more information, as they might do something too. That felt validating because I’d tried to sell this story to Sierra and Audobon mags and got no reply from either. The story came to be because our group of cyclists touring in Delmarva happened to camp near Michael. Only when cycling out of the park after a two-day stay did I decide I couldn’t pass up the opportunity. So I did a quickie interview and Wessel took photos. Travelers who visit Assateague State Park in Maryland are accustomed to unusual sights, what with more than 100 wild horses freely roaming the grounds. But last summer, something manmade captured the attention of parkgoers as well. At one of the 350 campsites along two miles of the Atlantic Ocean stood a 28-foot whirring wind turbine powering the batteries of a Coleman Camper travel trailer. Its creator was Michael Powers, who will return to the island park in late-July with an even more efficient version of his eye-grabbing contraption. Powers, who lives near Baltimore, got the idea last spring of providing power for the camper’s two 13.8-volt batteries. Having gone with his wife and three children to Assateague for many summers, he figured the island’s constant breeze would be a perfect spot for wind energy. 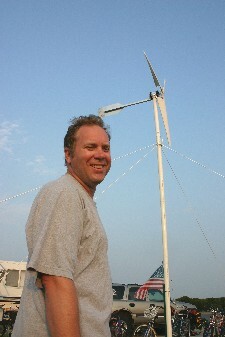 He first set up the turbine in his back yard, which, he notes, did not thrill his suburban neighbors. The whole thing cost about $80, which included a $34 permanent-magnet motor and a $25 rotor, both purchased on eBay. He used PVC piping for the mast instead of the usual metal so as not to attract lightening. 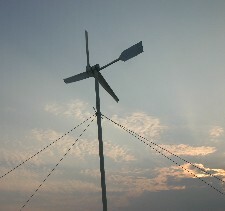 The wind supplied enough energy to power the campers’ lights, refrigerator, oven fan, and water pump. This year Powers plans to increase the turbine’s efficiency by using fiberglass for the blades and switching out the steel rotor for a lighter aluminum one. He’s even considering using the wind to power a fan that would blow air across an ammonia-based evaporator to provide air conditioning. Once he sets up again at Assateague, Powers and his highly visible windmill are sure to draw another round of curious campers. This entry was posted on May 15, 2008 at 8:25 am and is filed under Bicycling, Environmental, Travel writing. You can follow any responses to this entry through the RSS 2.0 feed. You can leave a response, or trackback from your own site. Yes!! This is really great, and it really makes sense when camping. Of course, we are not all engineers. Fortunately, there are these new micro turbines that can easily be fitted on to an RV. Excellent. Thanks for the tip! Well, I don’t think the inventor will see this posting, but if he does, perhaps he’ll get in touch! Good luck with that!